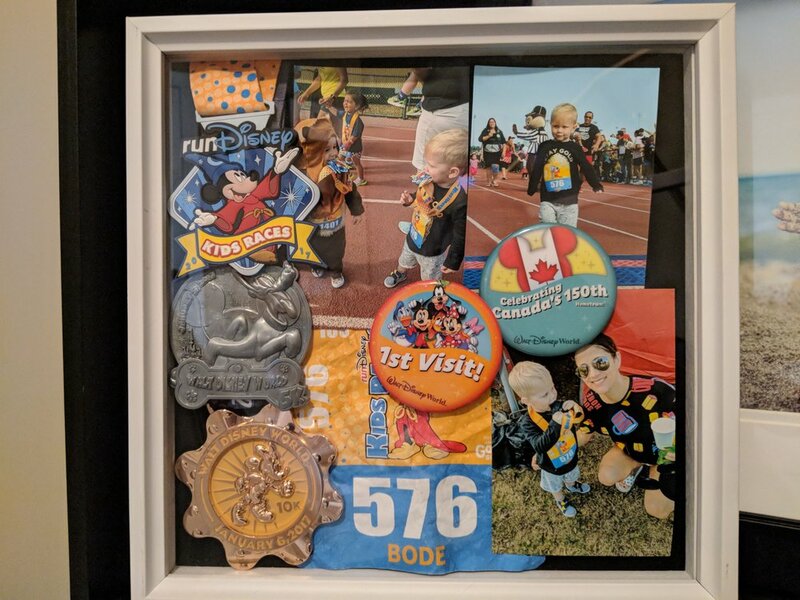 Any Disney runner knows that it can cost you an arm and a leg if you pay for a custom medal display. In 2017 the whole family participated in the race weekend in January and I wanted to frame them myself, and not spend hundreds and hundreds of dollars. For $19.99, take an extra 40% off since I have the Hobby Lobby app, I came up with the following. It can be found h ere. I used tape to hold the photos in place, and the medal strings are hanging out the back. I pinned the buttons on using their own backing and also used them to secure the photos even more. I have had these displayed for over a year and everything is still where it should be. The 12x12 size of the frame perfectly fit three medals, which leads me to believe that the 8x8 would hold two in a row. The larger size would be able to display Dopey challenge medals and maybe one photo and your number. How do you display for favourite race memories?